Why This is The Right Time to Invest in Food Private Label? Shoppers today appreciate the quality and value that private label brands bring to them. While some people believe that private label products have run their course, Nielsen published a report in 2018 pointing to the contrary, illustrating that products with private labels are, indeed, rising again in popularity. The private label product market is set to reach approximately $220 billion by the year 2020. Now is the time to invest in food with private labels. Private label foods saw their most significant increase in popularity during the recession of 2008. While some think that these labels reached their pinnacle then, many know that they continue to increase in popularity as today’s shoppers appreciate the value they provide. Eventually, there will be another recession. Also, penetration of private labels in Europe is significantly higher than in America. Penetration there is over 40 percent. Consumers in America have started to shift their thinking as millennials, and other shoppers seek products they see as “clean-label” that haven’t benefited from branding. They tend to steer clear of foods with an extensive lists of ingredients. Two German discounted stores have exploded in popularity in the U.S., and they’ve expanded aggressively. The two stores, Lidl and Aldi, are both planning to expand across America and saw growth rates between 7 and 8 percent during the period between 2009 and 2014. Aldi currently is a top-20 grocer in the states. Popular U.S. chains Trader Joe’s and Whole Foods newer store 365 by Whole Foods also increased their revenues steadily over the last 9 years and provided mostly private label products. Private label foods have branched further for people seeking less expensive options. Now they’re seen in prepared foods, granola, salsa, and more. These chains dramatically changed peoples’ expectations of the products that they buy. 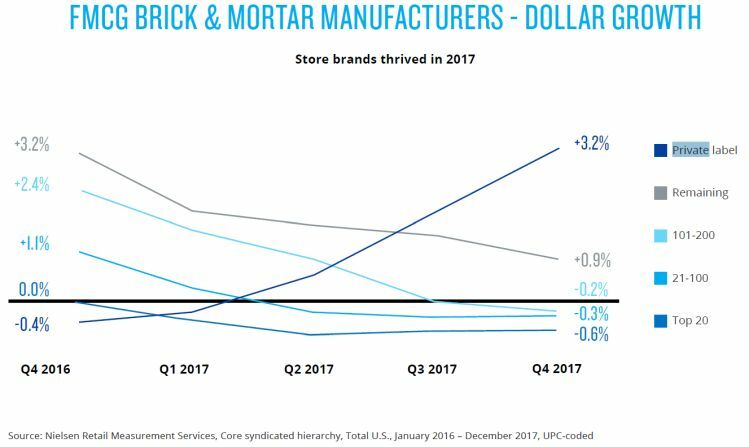 25-30 percent higher profit margins for retailers provide an incentive to bring private label products to consumers as alternatives to branded products popular in the past. Price is a huge factor for people when choosing products to buy and they want healthy, high-quality foods. Studies show that when people had to adapt to cost-saving methods during economic depressions, they didn’t revert back to old spending habits when the depression comes to an end. For this reason, private label brands continue to grow in popularity. There are numerous opportunities for private label brands in the United States. Enhanced product strategies meet consumers’ needs. Those offering tiered options such as “good/better/best” are seeing excellent success because they meet shoppers’ needs by brand positioning that utilizes different price points. Branded suppliers will struggle because options like these contradict their branded offerings. Fresh-to-go offerings are set to grow as everyone knows how popular prepared foods are for U.S. consumers trying to save time and money. Stores such as Whole Foods have pushed past plain sandwiches and sushi and expanded their ready-to-go foods exponentially. The expansion of private labels into choices such as salsa, prepared food, and granola as mentioned above, provide incredible opportunities for all brands. Kroger’s Simple Truth product line is a fine example because this product line introduced products without 101 ingredients that concerned their shoppers. In 2015, Simple Truth saw $1.5 billion in sales. Energy drinks also provide an opportunity for new and current brands. They don’t take up much shelf space, and the existing base for private-labels is small compared to categories such as sparkling bottled water. One Texas A&M study illustrates that consumers will swap between brand name energy drinks such as Rockstar and Monster when prices rise. Private food labels exhibit trends that show some products are rising rapidly. For instance, Costco uses alcohol’s price elasticity in a strategy netting them $270 million in wine sales all over the world and proceeds are projected to continue growing for the next few years. Studies illustrate that people buy more products when they are less expensive. 25 to 45 percent markups are standard in the alcohol industry. Costco maintains around 10 to 14 percent with their Kirkland brands. On a $7 wine, that’s a price difference between $7.84 and $9.50. The bottled water market also has the same trends. Generic product offerings such as Stop & Shop’s Nature’s Promise Water Beverage and Walgreen’s Nice! Spring Water are becoming more popular than common household names such as Poland Spring and Dasani. The generic offerings in the private label category for bottled water outperformed Dasani 2.3X for a total of 29 percent of all global sales in bottled water. As you can see, private food labels are becoming more popular, and studies illustrate that this upward trend will continue. Now is the perfect time to invest in them as consumers continue to crave high-quality products at economical prices.